In the final chapters of the book of Judges – and into the tiny book of Ruth – we find a sampling of what life was like in early Israel during the time when the various “judges” led the fledgling nation. Each account provides us a glimpse into not only the everyday life of the Israelites – but also their declining spiritual state as well. In Judges 17-21 we are given insight into two situations which happened sometime during the period described in chapters 1-16 of Judges. These times were aptly summarized as “In those days Israel had no king.” This is a way of saying that everyone pretty much did as they pleased and lawlessness was on the increase throughout the land. Israel was basically a tribal state, with groups of people ruling themselves. The two Levite stories – one Levite who sells his services to the highest bidder – and the second Levite who casts off his concubine to save his own skin – both describe the serious spiritual state of the nation. Israel had fallen so far from the days of Joshua and the elders that widespread sin had infected her to the core. One Levite had no qualms with serving foreign gods for a quick buck, (revealing how idols had become a “normal” way of life for God’s people – even mixing idol worship with the Law of Moses). The other Levite found himself in the midst of rampant sin that had infected an entire tribe. (Again – evidence of widespread sin). This Levite cared very little for anyone but himself – as proven by his treatment of his concubine. After reading the ending of Judges – one could easily abandon hope for Israel. We all heard Moses and Joshua plead with the people to be diligent and prevent this exact thing from happening – yet here only a few generations later – things have gotten so bad that even the Levites are corrupt and an entire 1/12th of the nation was condoning filth and vile practices and calling them normal. But then – just when all hope is lost – along comes the little book of Ruth. This book also is written of a time during the leadership of the judges. During the canonization process this book was almost left out of the Bible because it never mentions the Name of God in it – but as we have seen – it plays a vital role in our bird’s-eye view of the story of God and man. The account of Ruth – daughter-in-law to Naomi – unveils a light in the midst of grave darkness. Naomi (along with Ruth) finds themselves in a dark situation. In the beginning Naomi wrongly attributes this situation to God – but by the end she will learn just who God really is! This entire book is written around the Law of the Kinsmen Redeemer found in several places – but namely Deut 25:5-6. Included in the Law of Moses to protect the innocent and those who find themselves in a desperate situation – the account of Ruth proves that not everyone has totally ignored the instructions left to them by Moses/Joshua! Boaz – per his responsibility once the nearest kin declined – steps in and “redeems” Ruth – providing Naomi with a birthright to carry on the family name. That family lineage would trace from Obed to Jesse to King David (and eventually to the birth of Jesus). He must be financially and physically able to redeem. He must be willing to redeem. (This wasn’t forced – just expected). As par the course – we see Jesus all within these pages. Like Naomi and Ruth – the Bible says that humanity (you and I) are without hope. Lost in darkness with no chance for a future – we need someone to help us – come and rescue us – redeem us – buy back our lost property and purchase us from slavery. 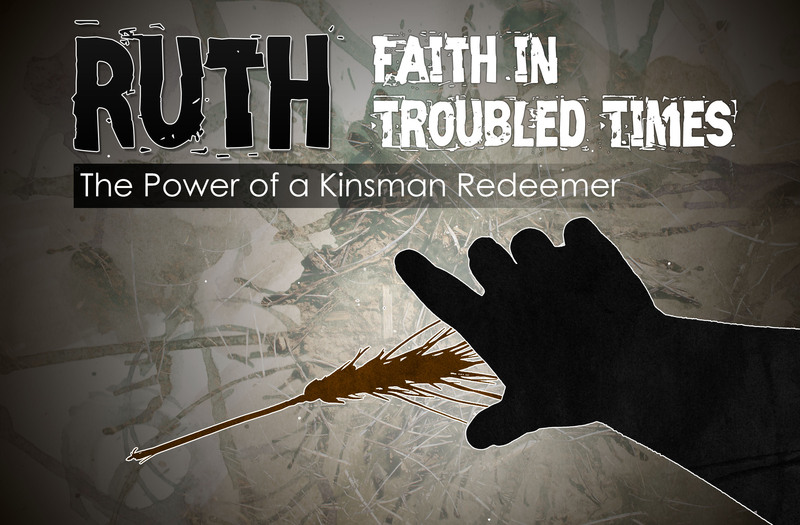 That One must meet the requirements of the Kinsman Redeemer. Jesus DID! You and I are invited to respond to this offering of redemption. We can choose to reject it – or choose to respond as Ruth did; “Cover me with Your garment…” (Ruth 3:9).